A few months ago I did a post on our CSA (Community Supported Agriculture) farm, which is one of the best things we have discovered in our little town of Leuven. CSA's are definitely not a uniquely Belgian phenomenon - the concept originally started in Germany, and the US is now the frontrunner with the most farms. 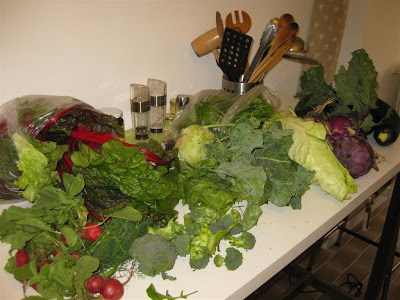 The idea is that members buy into the farm at the beginning of the year, and then share all produce throughout the year. We're not sure how many of these exist in Belgium, but we've been told not very many, so we're very lucky to be only 10 minutes by bike from one of them. There are also sugar snap peas, but we still have some left over from last week, and new beans which we didn't have time to pick. And some late strawberries, although we've had our fill already. Oh, and the cherries we picked never made it home... Next week the new potatoes will be harvested already! 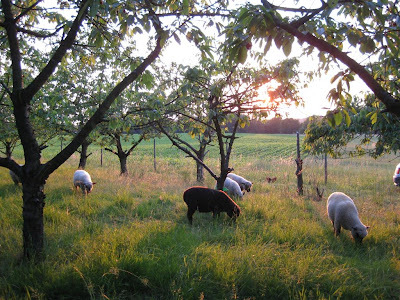 There are also chickens on the farm so we can buy fresh eggs, and last week we found out that the sheep that are grazing under the cherry trees, who we first met as little lambs in March, will be part of the offerings in the fall. Tom (our farmer) wants to keep a "pick your own" theme for that as well, though we're not quite sure how that's going to work yet. 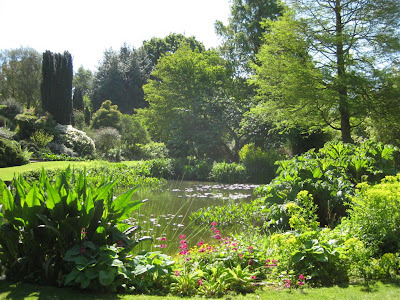 For a gardener, Beth Chatto has achieved some incredible things. Her name is regularly included in the lists of most influential landscape designers of the 20th/21st century, she has lectured around the world, received 10 consecutive Gold Medals at Chelsea, and was bestowed the highest award by the Royal Horticultural Society, the Victoria Medal of Honour. Not bad for someone who has only ever gardened in her own backyard. Now a pilgrimage site for thousands of gardeners, 50 years ago her 'backyard' (it's a few acres) was neglected land allowed to grow wild because the soil was deemed unsuitable for farming. Inspired by her husband’s interest in the origins of plants and their visits to many wild plant habitats, she set about transforming the garden. Given the challenges of the site, the most important principle she adopted was ‘right plant for the right place’. While this may not seem particularly revolutionary to us now, it was in her time, when everyone was growing the same standard roses, delphiniums and foxgloves anywhere and everywhere. This unique approach and the inspiring results brought her fame and recognition in the gardening world. Of course, she also wrote a few books along the way and started a nursery business. 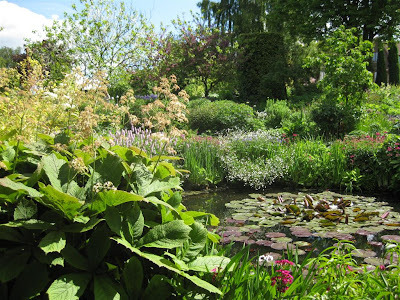 Visiting the Beth Chatto Gardens was definitely the highlight of our garden trip to Essex. The gardens are impressive for many reasons, but especially because of the extreme range of natural habitats that exist in a relatively small area. 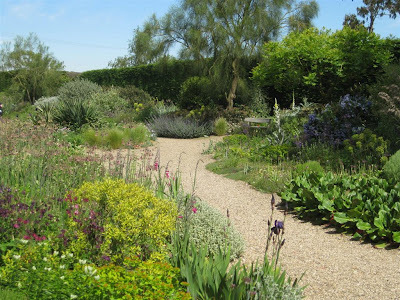 The most famous section is probably the non-irrigated, dry gravel garden where a surprising variety of plants flourish, many of which I would have never thought could even survive such dry conditions. This area was actually a bit smaller than I expected (given that she's written a whole book dedicated to it), but not less amazing. Past the gravel garden, the entrance to the garden proper is underneath a huge, ancient oak tree. From the hot, exposed gravel section, stepping underneath the shade of the tree and into the main garden area is like stepping into a green oasis. The garden runs along a natural valley where three large, interconnected ponds have been created. Everything is incredibly green and lush, with the ponds surrounded by large-leaved plants and bold grasses. This was my favourite area - I probably could have sat there for hours just staring. If you continue past the last pond and a reservoir, you arrive at the woodland garden. 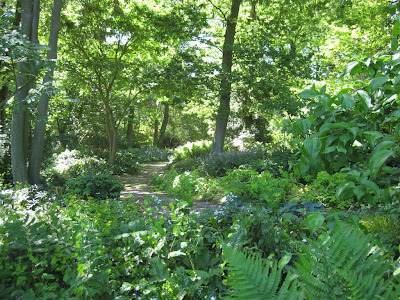 Shaded by some impressive, very tall trees, the woodland garden floor is completely packed with plants, many of which I didn't know but all of which were thriving. I loved this area because it was more relaxed in character (less gardened) which fitted perfectly with its woodland setting . 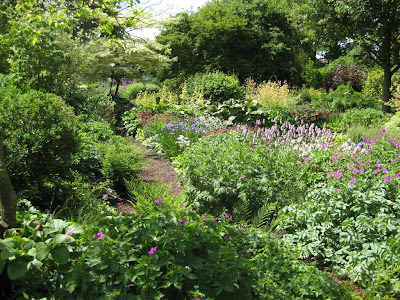 In between the woodland and water gardens there are also some more traditional garden beds, with many interesting plant selections and combinations. 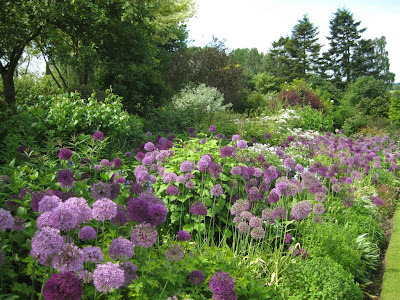 Beth Chatto has had an impressive impact on the gardening world, and I don't think it's only because of her plant habitat philosophy. On top of being a dedicated plant lover, I think it's her artistic eye, so evident throughout the gardens, which has really set her apart from so many others. A few weeks ago, poppies started coming up everywhere – on the side of the road, in neglected stone rubble piles behind buildings, and scattered across fields. It took me a little while to make the connection that we are in fact in Flanders, so these are the real Flanders poppies, rather than just the plastic Remembrance Day versions. It’s also a bit funny to see them now – I’m used to the plastic poppies coming out in November, so I was half expecting the real ones would as well. 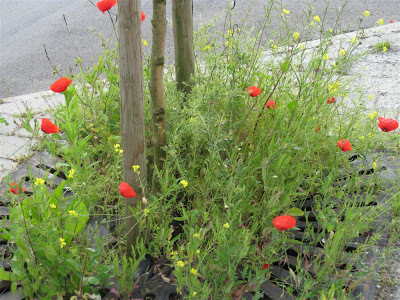 On the way to work, I ride past several concrete-imprisoned city trees which are now surrounded by masses of cheery poppies – a much better alternative to the concrete, stones or compacted soil that usually fills these tree pits. Around one tree, there was a veritable meadow – poppies, yellow and white flowers, a lone dandelion, grasses, and a few other plants. I don’t know their names, but I think there must have been at least ten plant varieties in that tiny area. I’ll be curious to see how the mini-meadow will evolve over the summer. Last weekend we also drove down to France, and the poppies there were spectacular. They completely covered the steep, rocky banks along the highway. 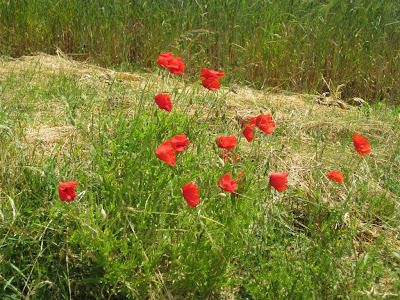 They were even more amazing in the wheat fields – beautiful yellow ripening wheat against bright red poppies. 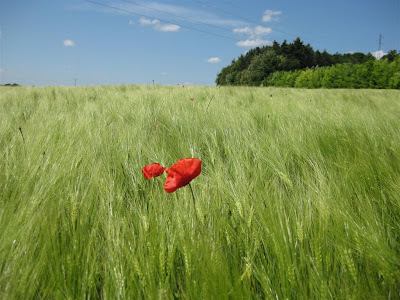 We now have a ridiculous number of wheat and poppies photos. The Chelsea Flower Show was a great and unforgettable experience, and you’d think the extravagance of attending it would be enough. But actually, it was only the beginning of a long weekend of visiting beautiful gardens in England. I was completely spoiled! After the show in London, we went off to Essex to visit the great gardens of Beth Chatto, one of my (many) gardening heroes. Since our time was limited, we decided to stay in Essex and visit some more gardens in the area. Each was unique and different, and each impressed me: the arid, hilltop garden at RHS Hyde Hall Gardens, the perfectly maintained nursery garden of Glen Chantry, and the wild and romantic Gibberd Gardens. We finished off with the “mother of all gardens”, the Royal Botanical Gardens Kew back in London. The first garden on the tour was Glen Chantry. 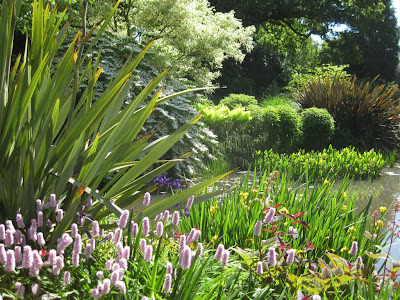 Owners Wol and Sue Staines have been developing this garden since 1976, along with a nursery for perennials. The site is 3acres, slightly sloping, and the design is informal. The majority of the garden is taken up by large borders chockfull of plants - it looks and feels like the perfect English garden. The flawless colour coordination was really noticeable - no plant was just placed somewhere to fill an empty spot. 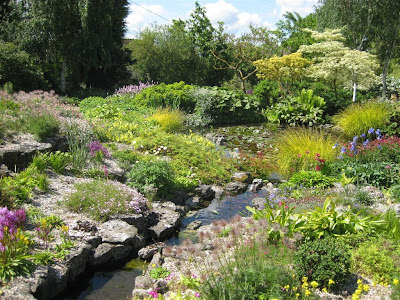 One of the features of the garden is a sequence of ponds and streams that that runs through the site, which provides habitat for moisture loving plants. 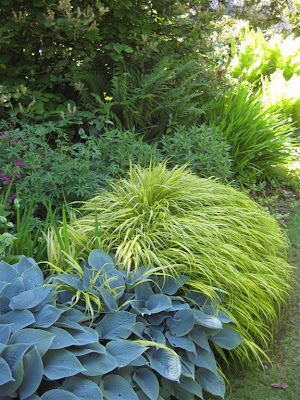 I particularly noticed some amazing specimens of Carex "Bowles Golden" grass, which made the one in my old garden look like a poor excuse for a plant. Lastly, there is also a huge rock garden at the front of the house with what seems like hundreds of miniature plants many of which were blooming during our end of May visit. Glen Chantry is first and foremost a plants garden. If you want to see what a plant looks like when grown to perfection, this is the place go. The colour and foliage coordination was also beautiful. And as a gardener, I was also marveling at the impeccable state of the whole site - I'm not sure how much help the owners have, but every bed was perfectly edged, every space perfectly balanced with plants and there was not a weed in site. A beautiful garden, but if you want to visit, this year is your last chance. The owners will be closing the garden and nursery at the end of the year, while still carrying on with "serious gardening" privately.